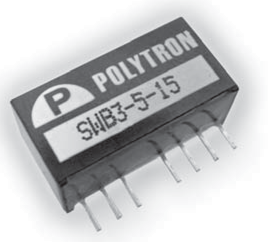 Miniature Single Inline Package (SIP) of 0.86" x 0.36" x 0.44"
Input Surge Voltage: 100 mS max. Nominal Vin: 2.5 mA max. Output Power: 3 watts max. Temperature Coefficient: ±0.1% °C, max. Isolation Voltage: 1600 Vdc, min. Isolation Resistance: 10^9 Ohms, min. Isolation Capacitance: 200 pF, max. Switching Frequency, full load to minimum load: 1000 KHz, min. Bellcore TR-NWT-000332: 3.963 x 10^6 hrs. MIL-HDBK-217F: 1.707 x 10^6 hrs.